B.C. Ministry of Health co-hosts the 2019 Dementia-Friendly Legislature Luncheon | Alzheimer Society of B.C. On March 5, 2019, Members of the Legislative Assembly (MLAs) from across B.C. were invited to a non-partisan luncheon co-hosted by the B.C. 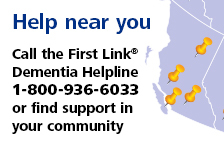 Ministry of Health and the Alzheimer Society of B.C. to talk about the importance of building inclusive communities that support people affected by dementia. The Honourable Adrian Dix, B.C. Minister of Health, welcomed everyone to the event and then Maria Howard, CEO of the Alzheimer Society of B.C., congratulated the MLAs on having the first dementia-friendly legislature in Canada, a commitment deepened this year by inviting people living with dementia to participate. B.C. Green Health spokesperson Sonia Furstenau emphasized that a dementia-friendly province is a friendly province – inclusive of all. Sharing her own connection to dementia, Official Opposition spokesperson Joan Isaacs spoke about the courage and impact of seeing families tell their own stories during Alzheimer Awareness Month in January. During the luncheon, guests were treated to a performance by the Voices in Motion – an intergenerational choir of high schoolers, people living with dementia and their caregivers – who are part of a research study at the University of Victoria that looks at the positive impact of inclusivity and engagement on people’s experience of the dementia journey. After the performance, choir members Priscila Kumar as well as Frank and Mary Peters shared their experience. According to Alzheimer’s Disease International, forty per cent of people living with dementia report not being included in everyday life. One in four people living with dementia hide or conceal their diagnosis, citing stigma as the main reason. Events like the Legislature Luncheon are key opportunities to amplify the voices of people who are directly affected by the disease, helping challenge stigma and change the conversation about dementia. B.C.’s Legislature is the first in Canada to become dementia friendly, and we celebrate our elected representatives’ ongoing commitments to building on that by welcoming and highlighting the voices of people – like the members of the choir – who are affected by the disease. Thank you to all the speakers for sharing their stories, and to the choir, as well as choir director Erica Phare-Bergh and the staff of Pacific Christian Secondary and St. Andrews Regional High School. Do you want to be part of the conversation? Become an advocate.